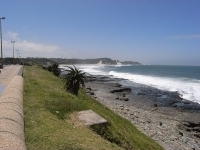 Gateway to the beautiful Wild Coast, East London is a small, friendly city on the Indian Ocean where activities like surfing, fishing, and golf take precedence. The city centre branches out into business parks, malls, and suburbs set in subtropical vegetation, dissected by many rivers including the Buffalo and Nahoon. The rivers' wide banks meander lazily into the ocean, offering locals excellent fishing, rowing, and cruising opportunities. Formerly built around a British fort, the city centre of East London is compact and can easily be explored on foot. There are a number of attractions, such as the East London Museum that houses the prehistoric coelacanth, and the City Hall, where the first TRC hearings were held. However, it is best for visitors to have a car so that they can access various attractions dotted on the outskirts of East London, including Steve Biko's grave, the aquarium, the harbour, and the superb seafood restaurants that line the beachfront. East London is not generally considered a travel destination in its own right, but the nearby Wild Coast is one of South Africa's most stunning scenic areas. It takes only 20 minutes to get from the bustle of this small city to one of the tranquil and isolated holiday villages on the coast, where rolling hills of indigenous vegetation are met by long expanses of untouched beaches. Here, visitors can go horse riding on the shore, visit the Gonubie Nature Reserve, or stay at the Inkwenkwezi Private Game Reserve where the indomitable Big Five can be seen. East London is a sunny city that experiences hot summers and moderate winters. Temperatures in summer, between December and February, can reach over 86°F (30°C), with rainfall most common in the spring and autumn months. We are looking for contributors for our East London travel guide. If you are a local, a regular traveller to East London or a travel professional with time to contribute and answer occasional forum questions, please contact us.